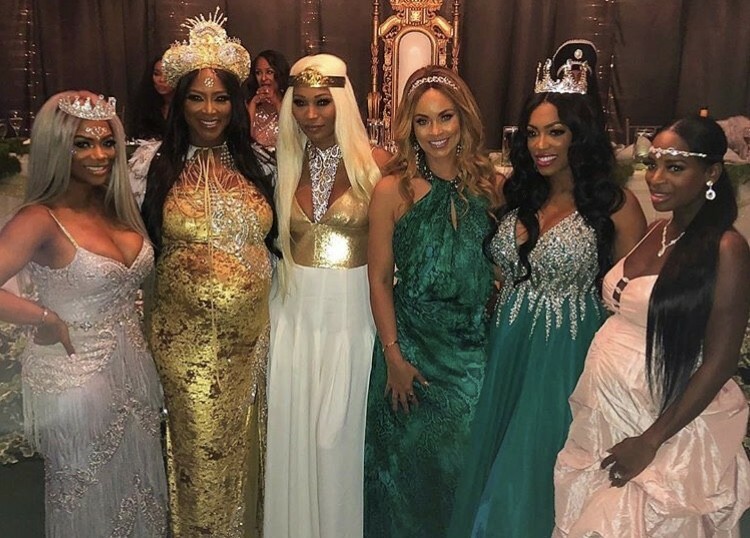 Even though Kenya Moore is no longer a Real Housewife, her baby shower was full of Bravolebrities. If only it was filmed for Real Housewives of Atlanta… Unfortunately, that did not happen, but at least Kenya and all of her guests took lots of photos to celebrate her first child with husband Marc Daly. All of the guests were crowns, gowns, and some of them even branched out with the metallic makeup to welcome baby Daly with a fairytale/royal bridal shower. Well, the theme is a little bit unclear, but they were pretty much all rocking crowns and looking like queens. Atlanta Housewives Kandi Burruss, Cynthia Bailey, and Porsha Williams were in attendance. Former Atlanta Housewife Claudia Jordan was there as well along with other RHOA favorites Miss Lawrence, Shamea Morton, and Kenya’s Aunt Lori. Married to Medicine cast members Toya Bush Harris and Dr. Heavenly Kimes went to the shower, which makes perfect sense since they live in Atlanta. Potomac Housewife Gizelle Bryant came through from Maryland for the shower. Check out the pictures from Kenya’s baby shower by clicking through the gallery below. TELL US- WHAT DO YOU THINK ABOUT THE PHOTOS FROM KENYA’S BABY SHOWER? WILL YOU MISS SEEING KENYA ON REAL HOUSEWIVES OF ATLANTA?